Home / Opinion / PCOO Usec: "The President said he would step down next year, I cried when I heard this." 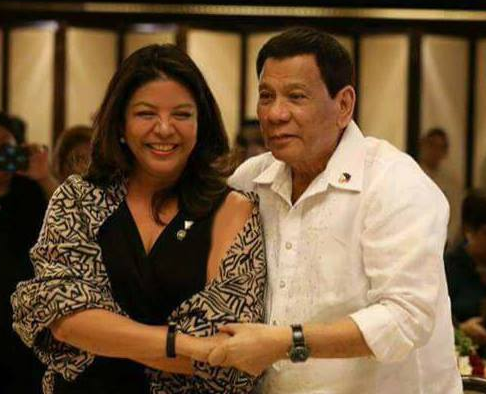 Social media personality, doctor and Presidential Communications Operations Office (PCOO) Undersecretary Lorraine Marie T. Badoy who's known to be greatly frank and honest in social media, took the liberty to again inspire her netizen followers and friends by sharing a "short chika" about what transpired to the the 27th Cabinet meeting with President Rodrigo Duterte. On her latest Facebook post, Usec. Lorraine recounted how she cried when President Duterte announced that he would step down next year and that he'd like for the nation to search for a transition leader. "I cried when I heard this. It might just be mindfuck to mindfuck the stupid fearmongers and dilaws in our midst and still just the thought of not having him as President made me want to weep. ", she wrote. Ms. Badoy likewise said that the hurt boiled down deeply when she imagined that someone who is lazy, incompetent, shallow, and insincere will actually replace a President who is not insatiable for power, a President who knows so well the poorest of poor people, the OFWs, the underestimated, the common Filipino and battles for his kin. But then again, Usec. Lorraine added that the President will not be here forever. He sounded exhausted and he said he was worn out. She added that she wanted to ask the President if he does not love the Filipinos any longer that he would wish a Robredo administration on the nation. "Gusto ko tanungin si Pangulo, "Don't you love us anymore?" 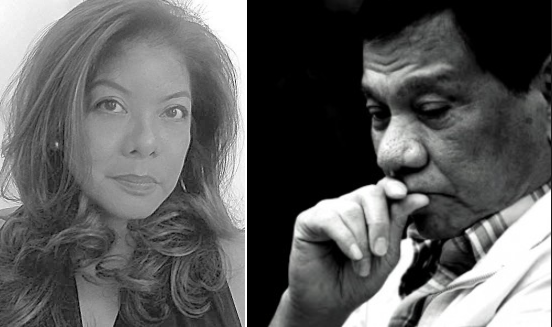 "Do you hate us that you would wish a Robredo presidency on us? ", Usec. Lorraine uttered. The PCOO Usec. then ended her post by encouraging the Filipinos to do whatever they can for the country while the man who sits in the most powerful position is true and fearless, amazingly competent and effective. "Let us do all we can for our country while the man who sits in the most powerful position in the country is true to us and is fearless. And amazingly competent and effective. ", she ended. Yesterday during the 27th Cabinet meeting (one cabinet meeting per month he's been in office), the President said he would step down next year and that he'd like for us to look for a transition leader. He sounded weary and he said he was tired. I cried when I heard this. It might just be mindfuck to mindfuck the stupid fearmongers and dilaws in our midst and still just the thought of not having him as President made me want to weep. Lalo nung inimagine ko si Leni ang papalit. Lord. Wala nang sasaklap pa. Lazy, incompetent, shallow, insincere, tauhan ng dilaw. Ano pa hahanapin mo, dba? Whole package. Gusto ko tanungin si Pangulo, "Don't you love us anymore?" "Do you hate us that you would wish a Robredo presidency on us?" I have not seen anyone less greedy for power as this man. And I have not seen anyone as eager to step down from public office as our President (except me, I am guessing). Often, he's talked about how he regrets running for the presidency. And he talks about how lonely it is at the end of his day when he steps on the barge that takes him from the Palace complex (his office) to the presidential home across Pasig River. And into an empty home bereft of Ma'am Honeylet and his apos. Today, I am off to a series of meetings and events and what this tells me--this announcement of the President--is that I should get as much done as I can while I have the resources available to me and that there is no time to waste. The same thing applies to all of us. President Rodrigo Roa Duterte will not be here forever. This President who knows so well the poorest of the poor, the OFWs, the marginalized, the ordinary Filipino and fights for all of us, will not be here forever. 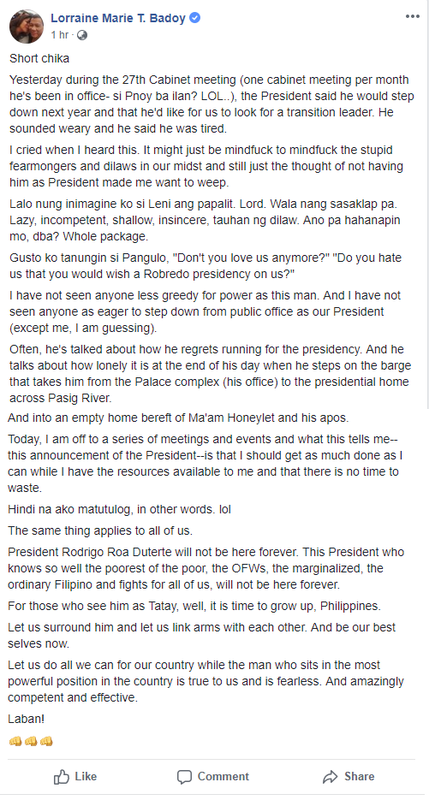 For those who see him as Tatay, well, it is time to grow up, Philippines. Let us surround him and let us link arms with other in our arms. And be our best selves now. Let us do all we can for our country while the man who sits in the most powerful position in the country is true to us and is fearless. And amazingly competent and effective.